The city of Boston will soon be flooded with runners who have been diligently training for the 2018 Boston Marathon. 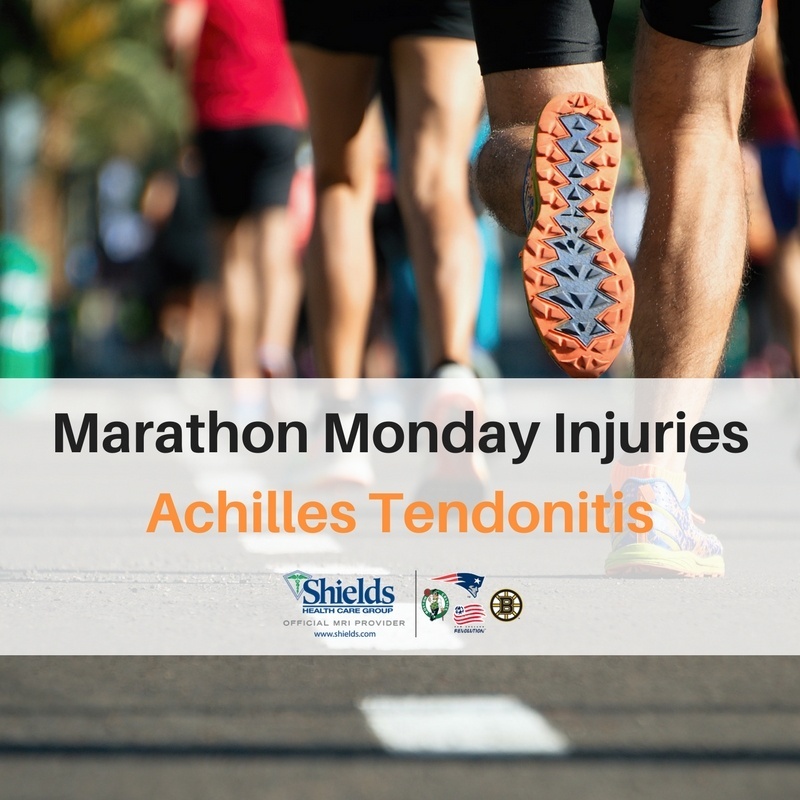 Most runners will be feeling excited that the day has finally arrived – but there will also be some who are dreading it, as they are dealing with the common running injury Achilles tendonitis. Achilles tendonitis is an overuse injury to the Achilles tendon, the large tendon that connects the calf muscles to the heel bone (calcaneus). This tendon is what allows you to jump, walk, run, or stand on the balls of your feet. This injury is more commonly found in runners who have increased the intensity or duration of their runs (*cough, cough, we mean you, marathon runners). Noninsertional Achilles Tendonitis – Characterized by tiny tears (degeneration) of the middle portion of the tendon. This is accompanied by thickening of the tendon, which may also begin to harden or calcify. Insertional Achilles Tendonitis – Characterized by involving only the lower portion of the heel, where the tendon attaches to the bone. The damaged tendon may begin to harden or calcify. Symptoms of Achilles tendonitis often include pain localized along the tendon or back of the heel, which worsens with activity. Stiffness or tenderness of the tendon in the morning and swelling that worsens with activity are also common. How is MRI used to diagnose Achilles tendonitis? MRI is used as a primary diagnostic modality for someone who is suspected of having Achilles tendonitis. Ultrasound (US) is another option, but is more commonly used for interventions, such as PRP injection. As with all exercise-related injuries, there are a number of factors that contribute to Achilles tendonitis. Achilles tendonitis is more common in men and in people of a younger age. It is seen more in younger people largely because they are more involved in recreational sports – i.e., more running, jumping, and sudden starts and stops, all activities that can aggravate the Achilles tendon. On the reverse end, obesity can also lead to higher strain on the tendon and a larger risk for tendonitis. In diagnosed instances of Achilles tendonitis, the initial treatment will almost always be rest. Reducing or stopping any high-impact exercise completely will result in less stress and will give the tendon time to heal. It may take several months (3+) for symptoms to subside with rest alone. Icing any affected areas can help reduce swelling and inflammation. In more extreme instances, when pain has not subsided with 6+ months of treatment, surgery may be used, depending on the extent of the injury. It’s important to know that every injury and athlete is unique, and the findings from the MRI, combined with the recommendation from your physician, will determine the right treatment plan for you. MRI costs vary depending on the type of scan and the facility where you receive your care. Shields MRI has 30 facilities across Massachusetts, New Hampshire, and Maine – and all of them offer the gold standard in MRI technology and the very best value. This particular MRI would fall under the category of a “lower extremity” scan, and with insurance can cost as much as $1,400 - $1,600 at a higher-priced hospital. To give you an idea of the savings you’d experience at Shields, for the same scan, the average price for this MRI would be about $750. As with all health care, these rates are not guaranteed and will be based on your insurance coverage and your specific plan. If you have any questions about price or would like an estimate for your scan, we encourage you to visit our online savings calculator or call 877-712-3075.